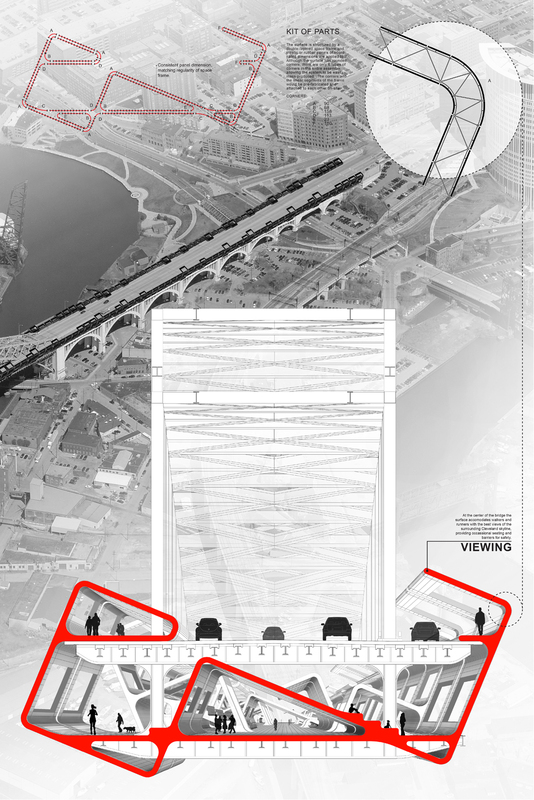 In order for Cleveland’s Veteran’s Memorial Bridge to host pedestrians, cyclists, and events, it most essentially needs a surface. Demonstrated here is a surface that extends and folds to gently imply boundaries and edges, offer seating and lighting, and host installations and events. 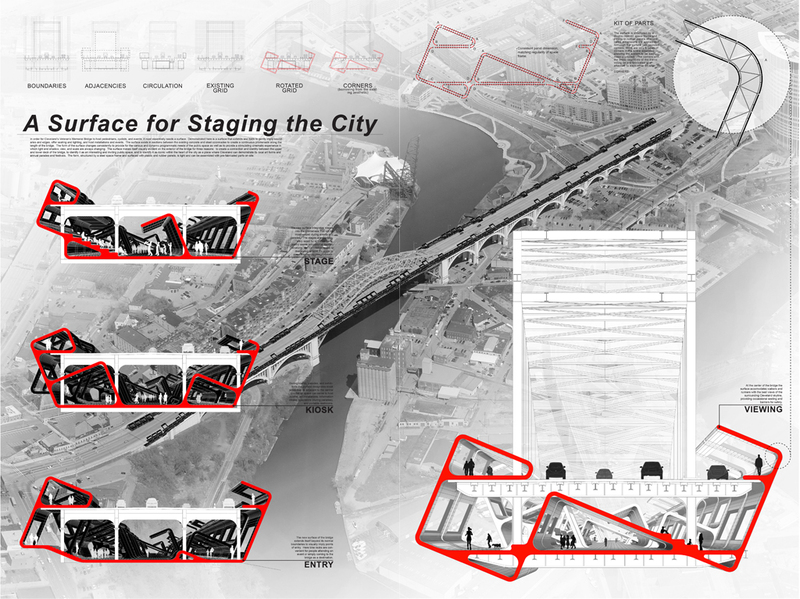 The surface exists in sections between the existing concrete and steel colonnades to create a continuous promenade along the length of the bridge. 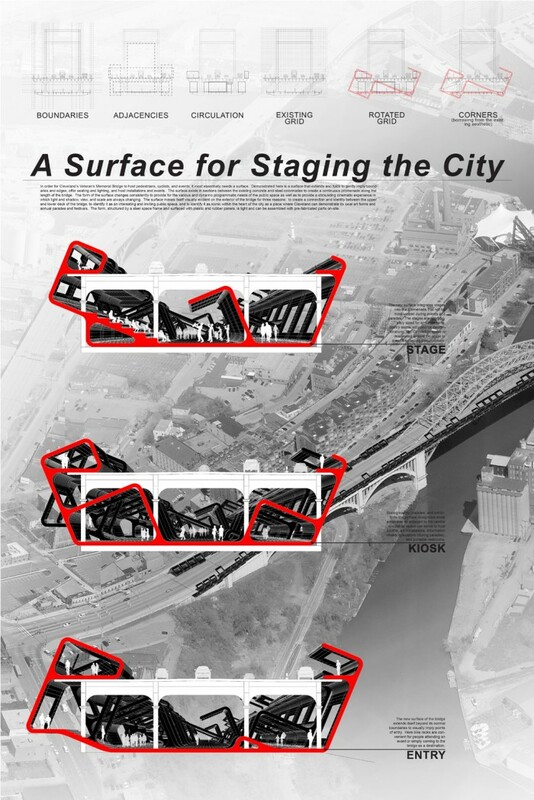 The form of the surface changes consistently to provide for the various and dynamic programmatic needs of the public space as well as to provide a stimulating cinematic experience in which light and shadow, view, and scale are always changing. The surface makes itself visually evident on the exterior of the bridge for three reasons: to create a connection and identity between the upper and lower deck of the bridge, to identify it as an interesting and inviting public space, and to identify it as iconic within the heart of the city as a place where Cleveland can demonstrate its local art forms and annual parades and festivals. The form, structured by a steel space frame and surfaced with plastic and rubber panels, is light and can be assembled with pre-fabricated parts on-site.